Baku – APA. A book titled “Yerevan city. 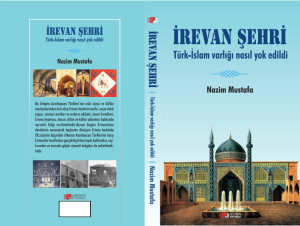 How was Turkic-Islamic existence destroyed” by Nazim Mustafa, Department Head of the Presidential Library, research fellow at the Institute of History of the Azerbaijan National Academy of Sciences, one of the authors of “Yerevan khanate” monograph, has been published. The book was published upon the initiative of the Center for Strategic Studies under the President of the Republic of Azerbaijan (CSS) and with the support of Berkan Publishing House (Ankara). The CSS told APA that the foreword for the book was written by Director of ANAS Institute of History named after A. Bakikhanov, corresponding member of ANAS, Professor Yagub Mahmudov. The book gives detailed information about the history of one of Azerbaijan’s ancient political and cultural centre Yerevan city, its ethnic composition, architectural monuments, craft patterns, theater of Yerevan, its literary environment, media, science, culture and public figures. It also deals with the mass murder, genocide and ethnic cleansing of the Azerbaijani people carried out by Armenians since early twentieth century in Yerevan, which is today the mono-ethnic capital of Armenia. Photos of historical and architectural monuments existed in Yerevan and destroyed by Armenian vandals time to time is available in the book.